Race The Lake of the Sky. Lake Tahoe, California. It’s the Feel Good Race Of The Summer and this year attracted hundreds of paddlers for a massive, grassroots celebration of the sport we love. Saturday saw over 300 paddlers race in the El Dorado 5 miler while Sunday was the big one: The 14 mile Emerald Bay distance race, which featured more than 150 serious competitors. To the surprise of nobody, Danny Ching swept the weekend, winning both the 5 and 14 mile races. The 404 front man was never seriously challenged in the 14 foot class, at one stage looking like he might even keep pace with the Unlimited leaders as well. Kai Lenny had been due to race, however he was a last minute withdrawal due to injury. Behind Danny in the 5 miler was a big battle among some very good paddlers, with Javier “Bicho” Jimenez stepping it up and showing once again he’s a force to be reckoned with. The Team Mexico representative picked up a pair of second place finishes, beating home the likes of Jay Wild, Cyril Burguiere, Rob Rojas, Chance Fielder, Noa Hopper and many more talented paddlers. Rob Rojas backed up his solid finish in Saturday’s race by taking line honours on Sunday. Although Danny again won the Elite 14′ category in the distance race, Rob took the overall win on his 18 footer, defeating fellow unlimited enthusiast Thomas Maximus in the process. Over in the women’s it was Candice Appleby taking out the 5 miler. The former BOP Queen continued her comeback from last year’s hand injury, however was given some stiff competition by Team USA rep and rising star Shae Foudy. The youngster from the Riviera stable showed that her epic performance in Nicaragua was no fluke and is now helping lead the way for a new generation of female paddlers. In the 14 miler, Candice opted for the prone division which left the door open for Shae to take out her biggest win yet. Another highlight was the SUP Cross. We don’t have the full results for that yet but it was certainly one of the funnest events to witness. The starting gate technology that Race The Lake has created is pretty freakin’ awesome and adds another element to the spectacle. Oh and just to make it a perfect clean sweep, Danny Ching won this race as well. Anik Wild took out the women’s Cross. But of course the weekend belonged to the kids, with the Grom Races attracting the biggest crowd and loudest cheers. 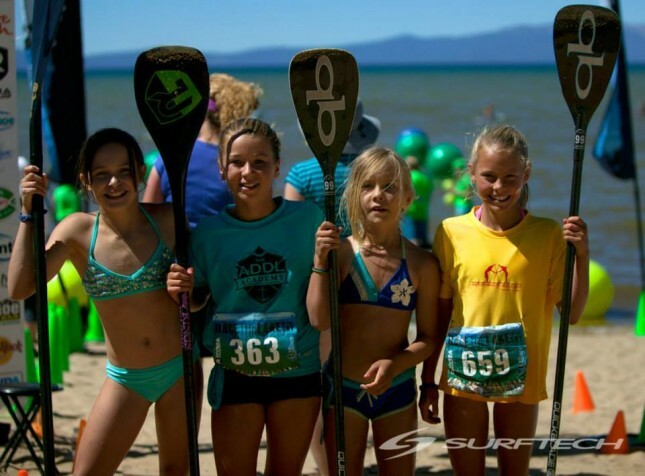 More than five dozen kids aged 6 to 12 did their best impressions of their grown up heroes as they zipped around the South Lake Tahoe course. Matix Springer was the quickest of the boys while Lexi Alston was the top girl (beating home 90% of the boys in the process). Check out the Grom Race results below and remember those names: They’ll all be kicking our asses in a few years (if not already…). Race The Lake of the Sky has officially become one of the races on the calendar. The weekend is one big happy festival that does an amazing job of promoting the sport and attracts all level of paddlers from far and wide. 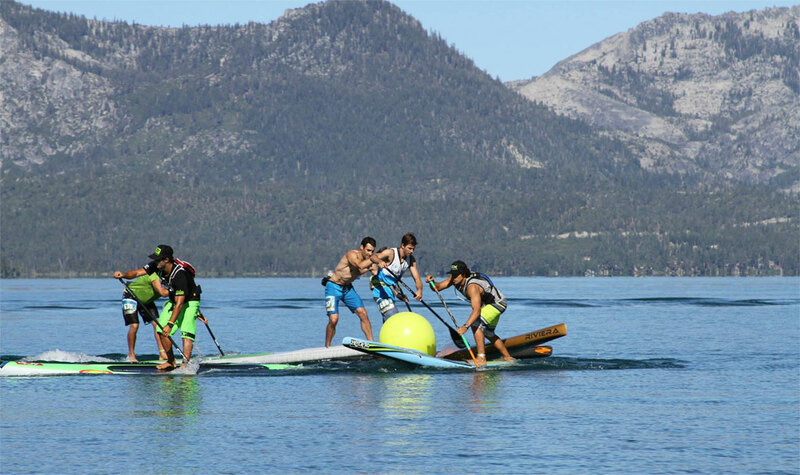 I nicknamed it the “Feel Good Race Of The Summer” after organiser Chris Brackett boldly said no to prize money, while Riviera’s Mike Muir coined the term “Gathering of the Tribes” to sum up just how many people descend on Lake Tahoe for this great event. Until then, check out the full results below. 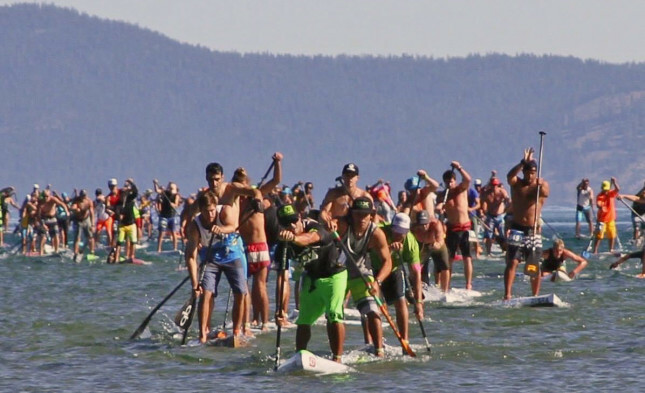 This was a grand spectacle as over 300 paddlers raced around the 5 mile course in front of the South Lake Tahoe ampitheatre. Thomas Maximus led them out on his unlimited but in the battle of the 14 footers, Danny Ching was in a race of his own. Mexico’s Bicho Jimenez sprinted to the line with Cyril Burguiere, followed closely by Jay Wild. In the battle for fourth it was a photo-finish-mad-dash-for-theline between guys like Rob Rojas, Noah Hopper, Chance Fielder and a few others. The shallow water near the finish made for some great carnage coming into the finishing chute. Some paddlers opted to run through the water while others paddled, creating a bottleneck that will surely produce some awesome photos. Post by Race the Lake of the Sky.